Extracted from the Eucalyptus globulus tree, Euclaptypus Essential Oil is a favorite essential oil amongst therapists and casual users alike due to its slightly sweet yet strong woody and camphor-like medicinal aroma. Popular in many vapor rubs, this oil is refreshing to the body, invigorating to the mind, and purifying to the spirit. Eucalyptus Essential Oil also emits an essence of cleaniness when you diffused it for aromatherapy and is traditionally used as a muscle rub, a decongestion aid, an antiseptic as well as an insect repellant. You can also use Eucalyptus Essential Oil for arthritis, bronchitis, catarrh, cold sores, fevers, flu, coughs, poor circulation, sinusitis, asthma, throat infections, and skin infections. Add 5 drops of Eucalyptus Essential Oil, 5 drops of Peppermint Oil, 8 drops of Grapefruit Oil to an ounce of water in a mister for an invigorating mist or just add 10 drops of Eucalyptus Essential Oil in a lamp ring diffuser for that feeling of positive energy. It is highly concentrated and should be properly diluted before using. It should be used with care and those with high blood pressure and epilepsy should avoid it at all costs and it may cuse headaches if this oil is used excessively. Keep this and other essential oils out of the reach of children and pets. Eucalyptus Essential Oil can be used on the skin for insect bites or wounds even though you should be taking care when you apply this oil. Dilute this oil into your gargle so it can be used to soothe a sore throat. 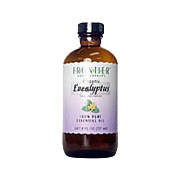 Eucalyptus Essential Oil Organic is shipped in a discrete, unmarked package. Orders are processed immediately and usually take about 3 to 5 working days to be received. We do ask that you try it for 2 to 3 weeks to feel the full effects. Any information received is used only for order processing and shipping purposes. Your information, such as e-mail address, will never be disclosed to a third party.